Some of our directors and prospective residents were recently interviewed by Rachel Savage for the Transition Free Press. You can read the full article “Community funds plan to convert offices into homes” on page 7 of the current issue below. On Tuesday 6th May, two of our steering group members were recorded for Dialect Radio, which airs every Thursday at 11am on BCfm 93.2 in Bristol. Elinor Kershaw (director and residents group liaison) and David Mowat (adviser and co-founder) talk about the history of AEOB, the issues we are trying to address, community investment and our potential site in East Bristol. Tony Gosling from Dialect kindly produced the YouTube video below using some of our pictures, or you can listen to the full program in which we featured at http://www.bcfmradio.com/dialect. All Government action on housing is directed at selling homes. Even the adjustment to planning regulations to allow conversion of derelict office blocks simply lets big developers convert them into flats to sell. This makes money for developers and for money-lenders, but does not solve the problem of lack of affordable homes. And it is expanding debt, creating more of the sub-prime mortgages that precipitated the last economic collapse and meant banks had to have a billion-pound bailout from the taxpayer. People taking the Government’s Help To Buy are mortgaging themselves to the limit of their income; and when interest rates go up, as they are bound to do, they will find themselves unable to cope, being repossessed and losing everything they have. “Stonesfield Community Trust, in Oxfordshire, has only had two rent rises in twenty years, and is now letting at below-council rents. It has paid all its debts and its still looking towards a £200,000 surplus to put into further social benefit for its village. This has proved it is possible for a voluntary non-profit organisation to make affordable rents wash their own face. We want to achieve the same for Bristol. We aim to work with Bristol Energy Co-op, which is aiming to make Bristol self-supporting for energy generation by spreading photo-voltaic panels over an increasing number of houses. Localising the economy is the answer to reducing the economic power of the big bullies.” Go to AEOBhousepeople.org.uk or Tel. 0117 9265931 to learn how to make an interest-bearing investment of £50 to £20,000 for Bristol’s future. The opinions expressed are the individuals, and do not necessarily represent the view of the society. Material posted here does not constitute an official statement from the group. ‘AEOB house people’ needs people now. Offer some of your savings to buy shares in order to buy land and buildings, to make a model social housing community in Bristol. I’m in this project waist-deep. Numbers on spread sheets make my eyes wobble. ‘Business’ feels uncomfortable; I earn less than £8,000 a year through my bits and bobs of freelancing. I can barely put up a shelf, let alone a house. So why do I find this scary project exciting? I used to feel guilty about having more than enough when others struggled. Over the years I learned how the so-called free market advantages those with assets in the bank or buildings whilst disadvantaging those with only their skills to sell. My parents in mid-retirement sold a house in Kent to buy one in Somerset in 1990. The price difference meant they could give me a good deposit on a house in Bristol which I bought for £39,500 in 1992. 20 years later the low mortgage is paid off. The house is now worth on this ‘free market’ about £150,000. Meanwhile a fellow parent-a qualified civil pilot- at my daughter’s nursery in East Bristol can only find work in call centres and retail outlets. He struggles to pay his rent. He would not get or be able to afford a mortgage. This state of affairs is unjust. It’s been compounded by governments (begun under Thatcher and continued by the Tories in New Labour guise) who’ve transferred thousands of public assets, council houses, into private hands. So there’s a huge shortage of affordable housing. And it’s significantly helped increase the divide in Bristol between the Have’s, largely in the north and west of the city, and the Have Less largely in the inner city, east and south. Meanwhile Mr guilty has, along with many of my class, become disillusioned with the banking system. I was pressurized into getting an endowment mortgage which brings a fraction of what was alluringly promised. What savings I have earn nothing in a system that crashed and lost its dynamism, its capacity to lend for the common good. I had already taken a so-called ‘ethical’ endowment policy. This is the passive ethics of avoiding the quick-growth but dodgy armaments, tobacco and extractive companies. What could I, a prudent radical, actively be for? How can I turn guilt into useful geld? What can I practically contribute to, to help make a more equitable world when governments have failed in their duty of care? Politics is often a game of safely blaming others. What better and more direct a way might there be to use my savings constructively when banks have lost my confidence? As a free-lance community worker I had been running reconciliation laboratories for a while at Saint Stephen’s church in Bristol when, last autumn, I asked if there were any rich or poor people at my Quaker Meeting willing to help find a way through the wealth divide in Bristol. “I’m a millionaire” piped up the chap sat next to me, “I’ll come to your meeting”. Now in ‘Rec Labs’ we sit in a space my colleague Tim Higgins at Saint Stephen’s Church describes as liminal and sacred. Instead of debating or exchanging views we create an atmosphere of deep listening and honest telling of our stories. In one theme or another we’re exploring ways through conflicts which over years have become encrusted into the very fabric of the city. What emerges is often surprising. AEOB was born in such a gathering last November. It wants to be a practical expression of reconciling this wealth-poor divide. It’s had various twists and turns. We’ve looked at the experience of the community-builders at the old South Bristol College site in Bedminster, heard from squatters and learned from Stonesfield Community Trust www.stonesfieldcommunitytrust.org.uk. People have come and gone and the vision is still being tweaked. Now, as we publish the community share offer we have on board Hari Beales, a young scientist from Brighton with experience in co-housing, Jim Kinnaird, a well-known housing activist and experienced cooperative housing member, Tony Crofts (the millionaire, in terms of property ownership), graduate architect Tom Eddington and myself. This is only the beginning. We need more people to be on the steering group-especially an accountant or business person. We all have our own livings to earn and lives to lead. There are tensions, for instance between those of us who are more cautious and those mindful of fast-changing markets and the need for decisiveness. It is hard to draw up a project which demonstrates a return for investors and a completion of loan repayments, yet is affordable to people on modest incomes. It is not absolutely certain your assets would be safe. Read the website and the small print. Ask questions. Judge for yourself. We do not want to set the blueprint too narrowly. It is the future residents, the real builders of the community, who will help design the details alongside architect Chris Askew and become the real co-managers of this community. Mostly they will be people rich in skills and aspiration if poorer in financial assets. They may well be amongst the 14,000 Bristol people on the council housing waiting list who have little prospect of earning enough points to acquire what little social housing there is. How they will select themselves or be chosen we have yet to work out. I know I don’t want to be a judge-that is part of the power divide. Experience tells me that those who start out together are not necessarily the ones who stay the course. It will not be an easy ride and the result will be a fair but not necessarily cheap rent. But for those, old and young, able-bodied and disabled, from whatever ethnic or cultural background, who long to be in community in a green housing complex, it will be a rewarding journey. I think we have to find creative ways to be in community, in dense neighbourhoods. ‘We’re full up’ was the message of residents at a recent Neighbourhood Forum, presented with our ideas. But the crammed-up feelings of individuals jealous of their space might be different when embracing partial community living. One exciting part of this journey is the prospect of taking part in a European-funded scheme which supports ‘adult learners’ which the team of future residents will be, to learn from other European projects (for instance in Latvia and Portugal) where groups of adults are engaged in community-led projects which pay a dividend of improving skills confidence and know-how. Where will this model social housing community be? Maybe on a particular site we’ve seen on Whitehall Road East Bristol. Maybe somewhere else. But first the money. Either way this story is an invitation to you to share your wealth for a while. If you’re like me, drop the guilt and reach for the geld. Make it work for reconciling rich and poor in Bristol and still receive it back for you, your children or grandchildren, some decades later. A group campaigning to turn disused office blocks into affordable homes wants to raise £632,000 to buy a derelict site in east Bristol. Abolish Empty Office Blocks (AEOB) said it had found a suitable property and has launched a community share offer. It said the buildings and land could be converted into 22 flats, gardens, a children’s play area and community cafe and would be run as a co-operative. If successful any development would be subject to planning permission. Bristol City Council met AEOB earlier in the month and said that although it had made no formal commitment it would “in principle like to work with the group to increase the delivery of affordable housing in the city”. It added that council officers were currently working on a separate project entitled “Offices to Homes Conversion Initiatives” which was set up following the relaxation of planning regulations over the next three years. Tony Crofts, from AEOB said: “The council currently has 14,750 on the housing waiting list – most of them are working people who can’t afford to buy or rent a home. “Homes only go to those who bid the highest which is immoral. It is possible to make affordable housing pay for itself in the way council housing used to. He said that once in profit the group hoped to be able to pay 3-5% interest on investment and shares. David Mowat, from AEOB, said: “We’ve come together to find a practical way to reconcile the divisions between the haves and the have-nots. The group said the flats, once built, would be available for renting. 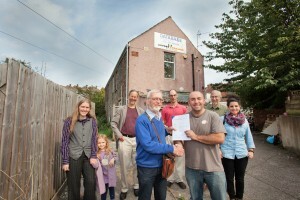 The organisation is run as a community co-operative – known as an Industrial Provident Society. People can invest a maximum of £20,000 to the generic share offer, which means that if this particular sale falls through then it can be transferred to another possible purchase. If the group does not manage to buy the office buildings investors have the option of having all their money returned. EMPTY office blocks could be transformed into new social housing under a plan put forward by a group of campaigners. Abolish Empty Office Blocks intends to launch a “community bond” to raise money for some of the 60 acres of unlet offices buildings in the city. Members of the group hope their plan can help ease Bristol’s housing crisis by providing affordable, sustainable, community-owned housing which cannot be sold off. The group’s three board members are looking for investment in the “common sense” project to revitalise derelict buildings and reduce the council housing waiting list. Tony Crofts, founder of Stones- field Community Trust who also worked on the Manifesto for Bristol campaign, told the Bristol Post that the project could help thousands of people who are priced out of housing in the current market. He said: “13,860 council houses have been sold off by Bristol under Right to Buy, transforming them from affordable homes into high-cost speculative investments. He said that by registering a co-operative Community Interest Company the group could launch a Community Share to raise money to buy empty land and unlet office buildings and convert them into affordable homes. He said: “It is our long-term ambition to replace those council houses with new, energy-efficient affordable homes with permaculture gardens, owned on behalf of the community, that can’t be sold off. “We hope people will invest in this project to set up a new Peabody-type trust and make Bristol a decent city that houses its people. 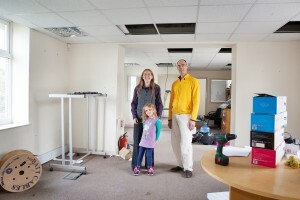 The Abolish Empty Office Blocks project is run by an number of people who are Quakers in Bristol. The Abolish Empty Office Blocks board includes Tony Crofts, Jim Kinnaird, founder Mina Road Housing Co-op, and Hari Beales, a permaculture and community expert. Chris Askew, an architect, is also working with the team to develop the project.